Calling All Gourmets and Wine Collectors! While we are first and foremost an educational institution, our community is made up of individuals with varied interests and hobbies. Living in the Bay Area, and with half of our population in a French immersion program and us being so close to Napa Valley, it’s not unusual that we have a good number of people who are deeply appreciative of wine. Five years ago, we decided to bring together our community’s passion for wine and passion for ISTP’s mission by creating the Soirée du Vin wine auction. Proceeds from this annual October live auction benefit our school’s Charlotte de Géry Endowment Fund. This fund provides long term support for our school, and is essential to our future. While Soirée du Vin supports our school, it really is an homage to true gourmets and avid wine collectors. This high-end event brings the best of both Old and New World winemaking methods in one, incredible evening. The food and wine is incomparable, as are the wine lots and non-wine lots (dinner at French Laundry; a Hawaiian retreat; a VIP tour and lunch at Château Palmer...). 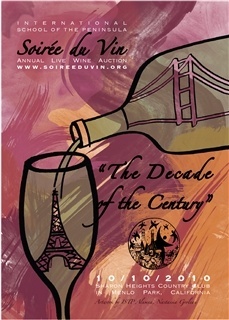 If you love food and wine, I encourage you buy a ticket or find out more information at http://www.soireeduvin.org. You won’t regret it!